For other places with the same name, see Tarnow. Tarnów (Polish pronunciation: [ˈtarnuf]; German: Tarnau; Yiddish: טארנא‎, Torna) is a city in southeastern Poland with 115,341 inhabitants as of June 2009 (metro area 269,000 inhabitants). 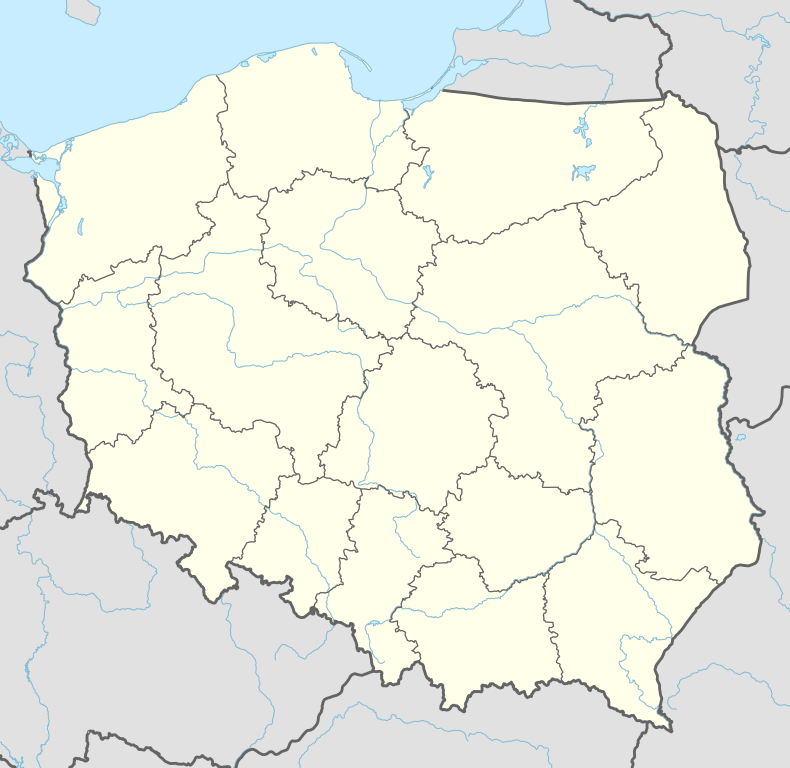 The city is situated in the Lesser Poland Voivodeship since 1999. From 1975 to 1998, it was the capital of the Tarnów Voivodeship. It is a major rail junction, located on the strategic east-west connection from Lviv to Kraków. Also from Tarnów two additional lines depart: a southward railway line to the Slovak border via Stróże, as well as a minor northward line to Szczucin (now defunct). Tarnów lies at the Carpathian foothills, on the Dunajec and the Biała rivers. The area of the city is 72.4 square kilometres (28.0 sq mi). It is divided into sixteen districts, known in Polish as osiedla. A few kilometers west of the city lies the district of Mościce, built in the late 1920s, together with a large chemical plant. The district was named after President of Poland, Ignacy Mościcki. The first documented mention of the settlement dates back to 1105, spelled as Tharnow. The name later evolved to Tarnowo (1229), Tarnów (1327), and Tharnow (1473). The place name, Tarnów, is widely used in different forms across Slavic Europe, and lands which used to be inhabited by Slavs, such as eastern Germany, Hungary, and northern Greece. There is a German town, Tarnow, Greek Tyrnavos (also spelled as Tirnovo), Czech Trnov, Bulgarian Veliko Tarnovo and Malko Tarnovo, as well as different Trnovos/Trnowos in Slovenia, Slovakia, Serbia, Bosnia, and Macedonia. The name Tarnów comes from an early Slavic word trn/tarn, which means a thorn, or an area covered by thorny plants. Already in the mid-9th century, on the Tarnów’s St. Martin Mount (Góra sw. Marcina, 2.5 kilometes from the centre of today’s city), a Slavic gord was established, probably by the Vistulans. Due to efforts of local archaeologists, we know that the size of the gord was almost 16 hectares, and it was surrounded by a rampart. The settlement was probably destroyed in the 1030s or the 1050s, during either a popular rebellion against Christianity (see Baptism of Poland), or Czech invasion of Lesser Poland. In the mid-11th century, a new gord was established on the Biała river. It was a royal property, which in the late 11th or early 12th century was handed over to the Tyniec Benedictine Abbey. The name Tarnów, with a different spelling, was for the first time mentioned in a document of Papal legate, Cardinal Gilles de Paris (1124). The first documented mention of Tarnów occurs in the year 1309, when a list of miracles of Kinga of Poland specifies a woman named Marta, who was resident of the settlement. In 1327, a knight named Spicymir (Leliwa coat of arms) purchased a village of Tarnów Wielki, and three years later, founded his own private town. On March 7, 1330, King Władysław I the Elbow-high granted Magdeburg rights to Tarnów. In the same year, construction of a castle on the St. Martin Hill was completed by Castellan of Kraków, Spycimir Leliwita of Leliwa coat of arms (its ruins can still be seen). Tarnów Cathedral preserved one of the most beautiful examples of renaissance and mannerist tomb monuments in the country. After the death of Jan Tarnowski (16 May 1561), Italian sculptor Jan Maria Padovano began creating one of the most beautiful examples of Renaissance headstones in the Polish-Lithuanian Commonwealth. The monument of hetman Tarnowski is almost 14 meters tall, and stands in St. Anne Chapel, which is located in northern nave of the Tarnów Cathedral. Padovano completed his work in 1573; furthermore, he designed the Renaissance town hall, and oversaw its remodeling in the 1560s. At that time, in 28 niches of the town hall were portraits of members of the Tarnowski family - from Spicymir Leliwita to Jan Krzysztof Tarnowski, who died in 1567. In 1570 Tarnów became property of the Ostrogski family, after Zofia Tarnowska, the daughter of the hetman, married prince Konstanty Wasyl Ostrogski. In 1588, after Konstanty’s death, the town changed hands several times, belonging to different families, which slowed its development. Until the Partitions of Poland, Tarnów belonged to the County of Pilzno, Sandomierz Voivodeship. The town, like almost all locations of Lesser Poland, was devastated in October 1655, during the Swedish invasion of Poland, and as a result, its population declined from 2,000 to 768. In 1723, the town became property of the Sanguszko family, which purchased it from the Lubomirski family. After the first partition of Poland (1772), Tarnów was annexed by the Habsburg Empire, and remained in Austrian Galicia until late 1918. Austrian rule initially brought positive changes, as the town ceased to be private property, became the seat of a county (German: kreis), and of the Roman Catholic Diocese of Tarnów (1783). On March 14, 1794, Józef Bem was born in Tarnów. In the 1830s, under the influence of events in Congress Poland (see November Uprising), Tarnów emerged as a center of Polish conspirational organizations. Plans for a national uprising in Galicia failed in early 1846, when local peasants began murdering the nobility in the Galician slaughter. The massacre, led by Jakub Szela (born in Smarżowa), began on February 18, 1846. Szela’s peasant units surrounded and attacked manor houses and settlements located in three counties - Sanok, Jasło, and Tarnów. The revolt got out of hand and the Austrians had to put it down. Tarnów went through the period of quick development in the second half of the 19th century, due to the program of construction of railway system. 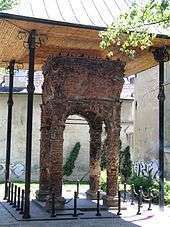 In 1852, the town received rail connection with Kraków, due to the Galician Railway of Archduke Charles Louis, and in 1870, its population was 21,779. In 1878, gas lighting was introduced, and three years later, first daily newspaper appeared. In 1888, the Diocese Museum was founded by Rev. Jozef Baba, and in 1910, Tarnów received modern waterworks, a power plant and a new complex of the main rail station. The city remained a hotspot of Polish conspirational activities, with up to 20% of all members of the Polish Legions in World War I coming from Tarnów and its area. On November 10, 1914, units of the Russian Imperial Army captured Tarnów, and remained in the city until May 6, 1915 (see Gorlice–Tarnów Offensive). In the early stages of the offensive, Tarnów was shelled by German-Austrian heavy artillery, which brought destruction to some of its districts. Tarnów was one of the first Polish cities to be freed during the rebirth of Poland following World War I. The Polish Legions liberated the city on the night of October 30–31, 1918. In the Second Polish Republic, Tarnów belonged to Kraków Voivodeship, and gave the newly established country many outstanding figures, such as Franciszek Latinik and Wincenty Witos. In early 1927, construction of a large chemical plant was initiated in the suburban village of Świerczków (pl), which is now a part of the industrial borough of Mościce, a district of the city. Before the outbreak of World War II, the population of Tarnów was 40,000, of which almost half were Jewish. On August 28, 1939, a Nazi saboteur conducted the Tarnów rail station bomb attack killing 20 civilians, two days before the invasion of Poland by Nazi Germany. The city was overrun by the German forces on September 7, 1939. Tarnów was incorporated into the General Government territory as the seat of the Kreishauptmanschaft Tarnow district on October 26, 1939. On June 14, 1940, the first mass transport left the Tarnów station to Auschwitz concentration camp, with 728 Polish political prisoners. All throughout the German occupation of Poland Tarnów was an important center of the Armia Krajowa (AK) and other resistance organizations. In the mid-1944, AK’s 16th Infantry Regiment “Barbara” took part in Operation Tempest. The Wehrmacht retreated from Tarnów on January 18, 1945, and the city was captured by the Red Army. A few months later, the Museum of Tarnów Land was opened, and Tarnów began a postwar recovery. In 1957, State Theatre of Ludwik Solski was opened, and in 1975 Tarnów became the capital of a voivodeship. Before World War II, about 25,000 Jews lived in Tarnów. Jews, whose recorded presence in the town went back to the mid-15th century, comprised about half of the town's total population. A large portion of Jewish business in Tarnów was devoted to garment and hat manufacturing. The Jewish community was ideologically diverse and included religious Hasidim, secular Zionists, and many more. Immediately following the German occupation of the city on September 8, 1939, the persecution of the Jews began. German units burned down most of the city's synagogues on September 9 and drafted Jews for forced-labor projects. Tarnów was incorporated into the Generalgouvernement. Many Tarnów Jews fled to the east, while a large influx of refugees from elsewhere in occupied Poland continued to increase the town's Jewish population. In early November, the Germans ordered the establishment of a Jewish council (Judenrat) to transmit orders and regulations to the Jewish community. Among the duties of the Jewish council were enforcement of special taxation on the community and providing workers for forced labor. During 1941, life for the Jews of Tarnów became increasingly precarious. The Germans imposed a large collective fine on the community. Jews were required to hand in their valuables. Roundups for labor became more frequent and killings became more commonplace and arbitrary. Deportations from Tarnów began in June 1942, when about 13,500 Jews were sent to the Belzec extermination camp. The first major act in the extermination of the Jews of Tarnów was the so-called "first operation" from 11–19 June 1942. The Germans gathered thousands of Jews in the Rynek (market place), and then they were tortured and killed. During this time period, on the streets of the town and in the Jewish cemetery, about 3,000 Jews were shot; in the woods of Zbylitowska Góra a few kilometers away from Tarnów a further 7,000 were murdered. According to a document from Michal Borawski born in 1926, featured at the entry of the Bimah as part of the panel offered by the Batorego Foundation, the street stairs (małe schody or little stairs) from the town-center to the Bernardynski street (where the Bernardine Monastery is located), had to be cleaned of the blood by the local fire brigade for three days. After the June deportations, the Germans forced the surviving Jews of Tarnów, along with thousands of Jews from neighboring towns, into the new Tarnów Ghetto. The ghetto was surrounded by a high wooden fence. Living conditions in the ghetto were deplorable, marked by severe food shortages, a lack of sanitary facilities, and a forced-labor regimen in factories and workshops producing goods for the German war industry. In September 1942, the Germans ordered all ghetto residents to report to Targowica Square, where they were subjected to a 'selection' in which those deemed 'non-essential' were singled out for deportation to Belzec. About 8,000 people were deported. Thereafter, deportations from Tarnów to extermination camps continued sporadically; the Germans deported a group of 2,500 in November 1942. In the midst of the 1942 deportations, some Jews in Tarnów organized a Jewish resistance movement. 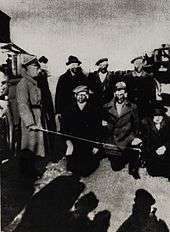 Many of the resistance leaders were young Zionists involved in the Hashomer Hatzair youth movement. Many of those who left the ghetto to join the partisans fighting in the forests later fell in battle with SS units. Other resisters sought to establish escape routes to Hungary, but with limited success. The Germans decided to destroy the Tarnów ghetto in September 1943. The surviving 10,000 Jews were deported, 7,000 of them to Auschwitz and 3,000 to the Plaszow concentration camp in Kraków. In late 1943, Tarnów was declared "free of Jews" (Judenrein). By the end of the war, the overwhelming majority of Tarnów Jews had been murdered by the Germans. Although 700 Jews returned in 1945, some of them soon left the city. Many moved to Israel. Tarnów is one of the warmest cities in Poland. The average temperature in January is −0.4 °C (31 °F) and 19.8 °C (68 °F) in July. It is claimed that Tarnów has the longest summer in Poland spreading from mid May to mid September (above 118 days). Tarnów is an important center of economy and industry. The city has chemical plants including Zakłady Azotowe w Tarnowie-Mościcach S.A., Becker Farby Przemysłowe Sp. z o.o., Summit Packaging Polska Sp. z o.o. ; as well as food plants (Fritar), building materials (Leier Polska S.A., Bruk-Bet), textiles (Spółdzielnia "Tarnowska Odzież, Tarnospin, Tarkonfex"), and several warehouses, as well as a distribution center of the Lidl supermarket chain. Tarnów is an important center of natural gas industry, with headquarters of three different gas corporations. Tarnów is an important road and rail hub. It lies at the intersection of two major roads - the motorway along European route E40, and the National Road nr. 73, which goes from Kielce to Jasło. Furthermore, the city is a rail junction, with four lines: three main electrified routes (westward to Kraków, eastward to Dębica and southward to Nowy Sącz), as well as secondary-importance local connection to Szczucin. The history of rail transport in Tarnów dates back to the year 1856, when the Galician Railway of Archduke Charles Louis reached the city. The architectural complex of Tarnów Main Station, fashioned after the Lviv railway station was completed in 1906 by the Austrian Partition. Since 2010, Tarnów station houses a gallery of modern art, the only such gallery located in a rail station in Poland. Tarnów also has three additional stations: Tarnów Mościce, as well as Tarnów Północny and Tarnów Klikowa, both of which are currently out of service. The city's public transport system consists of 29 municipal bus routes, which provide convenient transportation to all districts. In 1911-1942 Tarnów had a tram line, with the length of 2.5 kilometres, since replaced by buses. Members of Parliament (Sejm) elected from Tarnów constituency in 2005 included: Urszula Augustyn, PO, Edward Czesak, PiS, Aleksander Grad, PO, Barbara Marianowska, PiS, Józef Rojek, PiS, Wiesław Woda, PSL and Michał Wojtkiewicz, PiS. Member of the European Parliament elected in 2007 was Urszula Gacek, PO, EPP-ED. Roman Catholic churches, such as the Tarnów Cathedral (14th century, renovated in 1889-1900), and Holy Trinity church (16th century). ZKS Unia Tarnów - Zakładowy Klub Sportowy Unia Tarnów (Workplace Sports Club United Tarnów) - Soccer team, currently in the I League in the Polska Liga 2005/2006 season. Tarnovia Tarnów - Soccer team, also in II League in the Polska Liga 2005/2006 season. Unia Wisła Paged Tarnów - men's basketball team, 6th in Era Basket Liga in 2003/2004 season. Besides Catholics other Christian denominations are also present in Tarnów including: Baptist Church, Free Brothers Church, Jehovah's Witnesses, Methodist Church, Pentecostal Church, Seventh-day Adventist Church and the non-denominational Evangelical Movement "The Lord is my Banner". Before World War II there was a large population of Jews comprising half of the city's population, but now there remain just monuments of their past presence. According to 2007 Catholic Church statistics provided by the Instytut Statystyki Kościoła Katolickiego SAC, Tarnów is the most religious city in Poland, with 72.5% of the congregation of the Diocese of Tarnów attending Mass weekly. However, as noted by the Institute director, Father Witold Zdaniewicz, the church teachings are not being followed in the area of intimacy. Agata Mróz-Olszewska (1982-2008), The Polish volleyball Player, The twos Champions Europe in volleyball . 1 2 3 4 5 Gmina Miasta Tarnowa. "Kalendarium miasta Tarnowa". Retrieved 2016-04-01. ↑ Zdzisław Spieralski, Jan Tarnowski 1488-1561, Warszawa 1977, p. 124-125. ↑ (English) "Volume 24". The Penny cyclopædia of the Society for the Diffusion of Useful Knowledge. C. Knight. 1842. p. 66. 1 2 3 4 5 "Tarnow". Ushmm.org. OTRS Ticket. Retrieved 2013-04-24. 1 2 Jewish Community in Tarnów on Virtual Shtetl, the Museum of the History of Polish Jews in Warsaw. ↑ Adam Bartosz, In the footsteps of the Jews of Tarnów, 2007 Archived 2 March 2012 at the Wayback Machine. ↑ "Batorego Foundation english homepage". Batory.org.pl. Retrieved 2013-04-24. ↑ "TARNW, Weather History and Climate Data". Worldclimate.com. 2007-02-04. Retrieved 2009-05-06. ↑ Art-4.net. "Tygodnik Katolicki - Gość Niedzielny - Wydanie Internetowe". Goscniedzielny.wiara.pl. Retrieved 2009-05-06. ↑ "Miasta Partnerskie". Retrieved 1 May 2014. ↑ "Testvértelepülések". Retrieved 30 April 2014. ↑ "Miasta partnerskie i zaprzyjaźnione Nowego Sącza". Urząd Miasta Nowego Sącza (in Polish). Archived from the original on 2013-05-23. Retrieved 2013-08-01. ↑ "Löb Judah B. Isaac". JewishEncyclopedia.com. Retrieved 2013-04-24. 1 2 "Kellner, Leon". JewishEncyclopedia.com. Retrieved 2013-04-24. ↑ "Lipiner, Siegfried". JewishEncyclopedia.com. Retrieved 2013-04-24. ↑ "Öttinger, Joseph". JewishEncyclopedia.com. Retrieved 2013-04-24. ↑ "Weissmann-Chajes, Marcus". JewishEncyclopedia.com. Retrieved 2013-04-24. Wikimedia Commons has media related to Tarnów. This article incorporates text from the United States Holocaust Memorial Museum, and has been released under the GFDL as "Tarnow". OTRS ticket number. City of Tarnów English version of Tarnów's official webpage.